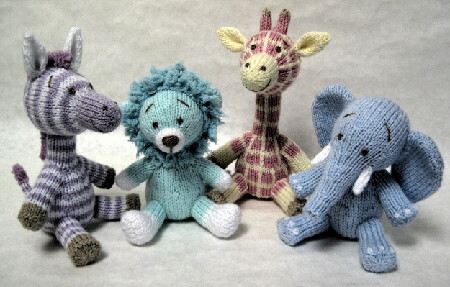 Measurements The lion and elephant are 6in (15cm tall), the zebra is 71/4in (18.5cm) tall, and the giraffe is 8in (20cm) tall. You will need Lion: Of Hayfield Baby Bonus DK 100g balls: 20g in Baby Mint 835; of Hayfield Bonus DK 100g balls: 1yd (1m) length in Walnut 927; of Hayfield Bonus Toytime DK 25g balls: 5g in White 961; of Sirdar Snuggly Snowflake DK 25g balls: 10g in Spearmint 651. Zebra: Of Hayfield Bonus DK 100g balls: 10g in Lilac 959 and 1yd (1m) length in Walnut 927; of Hayfield Bonus Toytime DK 25g balls: 12g in White 961 and 4g in Stone 889; of Sirdar Snuggly Snowflake DK 25g balls: 4g in Lilac 645. Giraffe: Of Hayfield Bonus DK 100g balls: 20g in Aran 993 and 1yd (1m) length in Walnut 927; of Hayfield Baby Bonus DK 100g balls: 10g in Baby Rose 867; of Hayfield Bonus Toytime DK 25g balls: 4g in Stone 889; of Sirdar Snuggly Snowflake DK 25g balls: 4g in Pink 644. Elephant: Of Hayfield Baby Bonus DK 100g balls: 30g in Baby Blue 854; of Hayfield Bonus DK 100g balls: 1yd (1m) length in Walnut 927; of Hayfield Bonus Toytime DK 25g balls: 2g in White 961. Pair of 3mm (no.11) knitting needles; 25g of washable toy stuffing for each toy; long tweezers; short pencil (for working lion’s mane loop stitch).